Former Bush frontman opens his soul to reveal trivial lyrics and mundane instrumentation. Oh, how the mighty have fallen. A mere 14 years ago, Bush looked to be the heir to the grunge crossover throne. Even if you couldn't fully get behind their debut masterpiece Sixteen Stones, you had to admit it was at least promising. Their follow-up Razorblade Suitcase was similarly promising, but seemed a step in the wrong direction, even though the British group was carving its place in pop-rock dogma. And yet with each release they seemed to become less and less relevant, going from pop powerhouse to irreparably obsolete by their fourth release. Sooner or later pretty-boy frontman Gavin Rossdale made his way to the big screen and departed the fame he found with Bush in favor of small side projects. And in 2002, Rossdale decided to get his Alfred Stieglitz on and play second fiddle to the skyrocketing mainstream success of his new wife, Gwen Stefani. 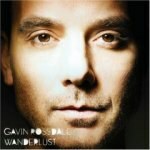 It seems though, that aside from watching the kids while Gwen was off touring, Rossdale has been working on something of a musical comeback: his first solo release WANDERLust, which certainly is … something. Gone are the days of rainy day theatrics and rock superstardom. Rossdale is stripped down to his most vulnerable, and embarrassingly inane self. If nothing else, WANDERLust proves that artists can no longer spew countless nonsequitors á la mid-’90s Pearl Jam and call it a legitimate song. Somewhere in the past 15 years, people decided they wanted lyrics to mean something and not just sound interesting coming muffled out of a drunken grunger's mouth. Such is the bane of Gavin Rossdale. Rossdale's random ramblings plague nearly every song of WANDERLust. Case in point: "This Is Happiness". Rossdale, with seemingly nothing to say, sings, "That was my favorite New York / You are the sea, so I dive in you / This is happiness." I'm sure this has some deep Freudian meaning to Rossdale. But to the average listener, it's mindless drivel. And songs like the egregiously named "If You're Not With Us You're Against Us" don't help him any ("I love you now, I've loved you not / I am the runaway, that turned to dust"). These are probably carbon copies of Bush lyrics circa 1994, but somehow they just sound scattered and parochial. The real difference between Rossdale's work with Bush and WANDERLust, however, is the instrumentation. Maybe it was a function of the time, but Sixteen Stones, for all of its crossover tendencies, was more or less a grunge album. WANDERLust sounds similarly of its time, but unfortunately that's equivalent to a hard-hitting American Idol contestant. For all of the introspection on this record, it sounds strangely hollow and thin, lacking the hefty substance that drew everyone to Rossdale's former work. He stands no chance of reaching the quieted strain of "Glycerine" or the I'm-gonna-fight-someone-tonight energy of "Machinehead". Frankly, Rossdale is a 42-year-old man (!!) trying to make 20-year-old's music. It's just not working. The one thing that has remained intact is Rossdale's ability to write some incredible melodies. While not all winners on WANDERLust, Rossdale proves he's not entirely over the hill. Tired and sentimental lyrics aside, "The Skin I'm In" is begging to be a karaoke track. The similarly tacky "Beauty In the Beast" has brooding verses, until Rossdale explodes with a certified golden chorus. Ultimately, WANDERLust is an album Bush fans never wanted to see but knew was inevitable. It was impossible that someone with as much charisma as Rossdale would simply fall off the musical map. But few probably thought he would fall this far. Yet that might be the album's greatest advantage. Bush fans will almost certainly hate this new incarnation, but Rossdale has opened himself up to an entirely new audience, disregarding the rampant disregard of grunge's past, in search of more luscious pop -- not to mention economic -- stomping ground.